A year ago today one of the characters I created in my book Elite: Reclamation was ‘killed’. Kahina Tijani Loren, or Salomé, the erstwhile Senator of the Prism system, was assassinated when trying to reach the Tionisla system. Either a spoilt brat, an explorer, a war criminal, a heroine, a terrorist, a freedom fighter or a mad woman with a fondness for oratory – depending on your outlook – her story came to an end on the 29th April, 3303 (2017). She aimed to expose the actions of and incite a revolt against shadowy powers that she claimed were manipulating humanity. At least, that was the narrative. I’m grateful for those who have catalogued her life and put it all together on the Elite Dangerous Wiki for folks to review. Authors have always killed favoured characters off, either as part of the plot, or even vindictively, citing the “kill your darlings” advice (sometimes attributed to G.K. Chesterton). This can generate shock, upset and outrage in the reader. It depends very much on what the author intended. Others might ask why the ‘death’ of a fictional character matters anyway. But Salomé’s death was different. It wasn’t the author who killed her, but a player of the game the novel was based upon during an in-game event. That in-game event, and the notoriety that surrounds it, remains a moment of note in the history of the Elite Dangerous game. Some say it was a triumph, that it showed the possibilities of community generated content, player group interaction and involvement. Others consider it a disaster, a foregone conclusion, a confused mess, an event that should have never taken place, a publicity stunt or shameless self-promotion. Many will subscribe to aspects of both views. I’m grateful to Frontier Developments for covering the event on their livestream, newsletter and the in-game aspects. Also to Obsidian Ant, who interviewed me beforehand, the streamers who attempted to cover the event live, to Lave Radio, who covered the aftermath of the event, those who worked so hard with me on the event and those who took part. There are many many articles online about it. This one from Polygon is by far the most accurate, as Charlie Hall was the only journalist who had the courtesy to check facts with me. Other online material ranges from the poorly researched or one-sided, through to the credulity straining (but of course, oh so compelling!) conspiracy theories. What you consider to be the ‘truth’ of the matter is entirely up to you. What actually surprises me is how many people are still talking about it, even after all this time – but here is my reflection on it, a year to the day. First, I’ll try to explain what I intended. The original objective, looking at it now, seems quite pedestrian. All I really wanted was for players to determine the ‘lore’ fate of a character by means of the game, so I could finish a book. That book (Elite Dangerous : Premonition) was a chronicle, of sorts, of player actions in the game. The set up was as simple as it could be yet still be meaningful; a “Catch me if you can” chase from one point to another, a “Trench Run” win or lose scenario – but with “Iron Man” rules – if Salomé was killed, she was killed – no escape pods, no rescue. Death. A finale for the book. That was all it was. Even that was problematic. I wanted it in “open”, so as to be as inclusive as possible. Folks were quick to point out that no one, absolutely no one ever in the history of the game, had survived in “open” with a target on their back for more than a few minutes. I was “signing her death warrant” by even considering it. Cue the accusations that I did ‘kill’ her, if indirectly. I did consider a private “Lore” group for the event, but that would have opened me up to two more problems – 1. Managing the group and any possible infiltration of it (Mobius has had a lot of problems here) and 2. Deliberately excluding a lot of the player base by an active choice. Decision to run in “open” made. There was the PC and Xbox issue (The PS4 version had yet to be released at the time). The two universes were parallel, the same in detail but not in instancing. Should there be a “PC Salomé” and an “Xbox Salomé”? What if one survived and the other didn’t – what was the actual outcome? I decided there “could be only one.” PC had the biggest user base and I didn’t (and still don’t) have an Xbox One. Multiple characters under the control of other players was the answer to that one so the Xbox community could be involved. Then there was the issue of the “Friends list” and somehow balancing the event so it would be worth people taking part. Salomé’s account had been accepting all friend requests since it was created many years before, without any discrimination. On the days leading up to the event hundreds of players requested to be friends. At the time (and I’m not aware this has changed since), the in-game mechanisms were insufficient for any given player to pursue another with the hope of being able to overtake and interdict them. We couldn’t advertise the destination without the danger of ‘base camping’. With a sufficiently fast ship and a long jump range, you had total immunity from any form of danger if you had no “Friends”. The “Friends list” gave away Salomé’s location, thus levelling the playing field. If you lost her, you had a way to find her again. Did it give too much of an advantage to those seeking to kill her? Another decision to be made. Friends list was to be non-selective. Ditto the loadout of the ship. To ensure maximum chance of success, Salomé should have had a lightweight engineered Anaconda or Asp optimised for jump range and refueling – but no hardened PvP build could have kept up – result? No gameplay. Canonically, Salomé flew an Imperial Clipper optimised for exploration (during the event it was engineered for shields, jump range and speed). She couldn’t (in the lore) suddenly conjure up an uber ship out of nowhere. Imperial Clipper it was, with all the limitations that brings. For the advantage, we should have used the best PvP pilot we could find, but again canonically, Salomé was not that pilot. She was a snooty Imperial who had flown a star-ship a handful of times, not a seasoned spacer. I choose to fly her in character, not because I was under the impression that I was a brilliant PvP pilot (as many have pointed out – I’m not) but more because I needed to ensure that she would respond to whatever happened on the fly and in character to make the lore consistent. Decisions, decisions. None of these decisions (and there were many others besides) were taken without rationale, but crucially, none were taken with a specific outcome in mind, or to provide favour to any particular faction or player group. They were taken with the aim of making a scenario that would actually work in practice. I was attempting to create an event that had a level of tension, where the outcome was uncertain and not a foregone conclusion. That really was the only objective. Ironically, the biggest risk I thought we had at the start was that no one would turn up and it would be a non-event due to indifference. That didn’t turn out to be a problem. The event was accused of being both over-hyped and under-advertised. There was no conspiracy, at least, not one instigated by me. Salomé was to be protected by the Children of Raxxla and Loren’s Legion, the members of which had proven their loyalty over years of faithful service. There was no compromise of either of these factions, despite claims to the contrary by many sources. SDC were never remotely trusted by Salomé’s core group at all. PAC was permitted to organise itself around information that CoR and LL ‘declassified’. The machinations that resulted were truly emergent gameplay of a type, whether in-game or meta game. The CoR and LL mission objective was simple. Get Salomé safely to Tionisla, regardless of what else was going on. Scenarios were trialled, tactics worked through, mock battles rehearsed in advance. We were prepared. The outcome needs little explanation. We all know the result. So, secondly, what is my stance on the event now, a year later? I caused excessive damage to Salomé’s ship evading interdiction throughout the chase, I didn’t have time to rehearse all the heat management expertise I needed. We had AFMUs aboard, but they were exhausted by the end. This was why we ‘slowed down’ – for repairs. The game did conspire against us with the usual issues – CTDs, wing connections failing, instancing issues, blue-tunneling etc. These were expected, but did contribute to the final result. Very shortly prior to the event Frontier had to patch the game to remove an “infinite packhound missile” bug. It was alleged, after the event, that some of the antagonists had exploited a bug in the game to make their ships engineered beyond reasonable expectations. I didn’t know about this in advance and have never seen a definitive statement from Frontier about it. I wanted an in-game event to conclude the book. The game mechanics were (are still?) borderline unsuitable for carrying this out. I pressed on when, arguably, I should have stopped after a more sober analysis. In my defence, this wasn’t the first time a lore related event in “open” had been attempted. I’d watched others run previous events (including those run by Frontier themselves), analysed them and thought I’d mitigated their failings in the design of this one. I understood the limitations of the game in theory, but not in wide-scale practice. I underestimated the emergent complexity of trying to organise even such a simple event within the context of Elite Dangerous. I opened myself up to accusations of engineering the outcome by having to make decisions that certainly influenced the outcome in an honest attempt to provide a level playing field. The sheer number of players who wanted to take part and their wildly different motivations for taking part. I had originally thought that only players who had some sort of interest in the ‘lore’ of the game would take part, this was not the case. I had anticipated hostile players of course, in fact I welcomed it – it made the event actually ‘dangerous’, what was the point if there were no stakes, no risk? That was the ‘lore’ reason for the bounties. Salomé and Co were wanted. I don’t know what the player count was, but I’m informed it was in the thousands. I failed to appreciate the wider agendas of player groups beyond my immediate horizons. The meta politics of SDC and PAC are worthy of a story in themselves. This was behaviour that I had not expected, or anticipated and certainly hadn’t instigated. I hoped that player groups would be “For” and “Against” (in fact Frontier put that option in the communication menu specifically for the event), but I hadn’t expected the tangled twists, infiltration of Discord, the ‘no fire/unarmed’ order directives and the other machinations that emerged. I knew of SDC by reputation (and had a brief interaction with them earlier on during one of the exploration CGs I ran). PAC’s arrival, behaviour and subsequent departure really was emergent ‘meta’ content. More occurred than I could actually keep track of. The backlash against me as the organiser of the event. Writers have to have tough hides, but let’s just say “Shields failed”, “Module damage” and “Emergency Low Wake.” I won’t be venturing into that conflict zone again. The level of opprobrium I received (‘salt’ in the gaming vernacular) was extreme. I’m not saying, necessarily, that it wasn’t warranted, nor would I say that folks aren’t entitled to their opinions – but when that level of vitriol is fired at a content creator, the community should not be surprised when that content creator looks at that response and decides to no longer provide content for them. I did have a number of possible outcomes pencilled in. I had, briefly, considered that Salomé would commit suicide, (certainly ‘lore-wise’ she was mentally unstable towards the end after what had happened to her) but that was rejected for being too ‘Deus Ex Machina’, taking the decision out of the hands of players and invalidating all the efforts of those players and factions who worked so hard in following and protecting her. If she died, she had accomplices that would hopefully make the run and her ‘requiem’ could be activated in game (as indeed it was). If she survived she had a speech to give and I had a plot for her to retreat to Colonia in exile (she had received an invitation to go there) and continue her insurrection from there – it was not to be. As far as I am aware nothing similar has been attempted since, perhaps it never will be based on what happened. I certainly wouldn’t recommend organising an event of that nature to anyone. Naturally, many people were wise after the event. Truth be told, some genuinely were wise prior to the event, but none of those had visibility of the meticulous planning and preparation that had taken place. I thank the many people who did appreciate what I tried to do and have told me so. Once again, huge thanks must go to the faction members of the Children of Raxxla and Loren’s Legion who did vast amounts of organising to create the event and to the extended groups beyond that, each organising their own contributions. It is possible to survive in “open”. Salomé managed one hour and forty five minutes under constant attack by experienced PvPrs (and one very determined NPC) with her location being advertised, whilst being valiantly defended, primarily, by the Children of Raxxla and Loren’s Legion in-game factions operating against a very well prepared and practised plan (subject to the limitations I had put upon them). Game issues contributed to her demise (the infamous blue-tunnelling and instancing issues). I believe that implies that I did, pretty much, balance the event about right. Salomé could have, against the odds, made it. Elite Dangerous can host a multi-player event, but there are severe limitations in the P2P architecture that constrain the type and conduct of such an event. There is a hunger for that type of game play, which remains largely unsatisfied. If someone can learn from this experience and generate an event that overcomes its shortcomings, they will have something quite amazing on their hands. Many players really do care about the lore. I was privileged to work with some truly amazing and hard working people in the course of the event. It’s very difficult to manage the ‘scope’ of an event. If you want it in “open” anything goes – roleplay and non-roleplay activity gets mixed. If you want it in a “private” group, you have to manage that group and all the issues that go with that management. Even a very simple event (in concept) is laced with vast complexity and needs a huge amount of work to execute; underestimate that at your peril. The Elite Dangerous community is, very much, a complex multifaceted thing. Generally, it has been very supportive to me over the years, but there are some less salubrious sides to it as well. I remain undecided whether running a “lore” event in “open” is a good or bad thing. On the good side it allows maximum participation without barriers, on the flip-side, anyone can take part and influence the outcome. In this case, the outcome was determined by a player who (as far as I can tell) has little to no interest in the lore of the game. He did from my perspective, as far as I was aware at the time, get the ‘kill’ fair and square, unpopular though that was. As I’ve mentioned, I did consider a “lore” private group – but how to police that? How could I practically vet the credentials of thousands of players? It would have been infiltrated regardless and thus the same outcome possible. Maybe having such a diverse community prevents the possibility of “lore” events entirely, perhaps they only belong in single player games with pre-programmed outcomes. But that seems defeatist to me. I tried something, it was controversial, it didn’t turn out how I expected. Maybe I shouldn’t have done it at all, but that’s not my way. Those of you who followed me from the Kickstarter back in 2012 know that I push and cajol things, try to make them better, work around problems and don’t take no for an answer. Lots of folks told me my Kickstarter wouldn’t work. It did. Lots of folks told me I couldn’t write a book where the players set the agenda. I did. Lots of people told me that I couldn’t survive in “open” mode for more than a few minutes. I did. With this event I didn’t want the expected. I wanted the community to do its thing and it did; good, bad, roleplay or non-roleplay. No it wasn’t perfect, no it had major flaws, but… there was high drama, tension, adventure, confusion, conflict, infiltration, intrigue, uncertainty, betrayal, subterfuge, heroics and, ultimately, tragedy. Isn’t that what we want at least some of our “content” to be like? After 5 years, it was time for me to move on from ED. Yes, this event and the response to it contributed to my decision on that score, but it wasn’t the sole consideration. I only tried to provide some of that elusive “content”, the lack of which was a constant refrain on the forums and on reddit. Thanks to those who have contacted me in appreciation of the story elements I provided. As for the story itself, the outline plot of Premonition and all the detail within was approved by Frontier. Much of what is in there is their lore construct and, as such, it is up to them to progress (or not) those myriad threads. My last GalNet article was published in May 2017, since then I’ve had no involvement. Michael Brookes, who was the main custodian of the lore at Frontier during my tenure, moved on from Elite Dangerous to work on Jurassic World Evolution shortly afterwards. I do not know who is curating the overall story and lore now. I am currently working in other fictional universes and aim to create other characters as equably memorable my infamous ex-Senator – but strictly in the safe confines of static novels! I am, first and foremost, a writer, an author… that’s what I do. Salomé on the eve of her assassination. Book wise, Reclamation had the advantage that the game world didn’t exist beyond concept-art and previous lore. Premonition was constrained by the game itself, the lore changes that had occurred since, and the need to incorporate player actions (and some interesting names!) into a cohesive story. As for Salomé, as an author I am gratified that I generated a character in the game lore that folks still talk about. I tried to codify the events that transpired in Elite Dangerous: Premonition as best I could. That was a risk I took knowing the community would probably throw me a curved ball in terms of the outcome as they had done before. I did want that curved ball – that was the point! This was a book about player actions in the game, for good or for ill.
Salomé wasn’t a cookie-cutter stooge, a one-dimensional good (or bad!) guy/girl, or a nondescript face with no backstory. She was complex and nuanced; some regarded her as a heroine, others loved to hate her. When she died there was a genuine outpouring of grief from some quarters. That a fictional game character can generate such an impact implies that I did something right in her creation. You can find her last message, in-game, in the Panacea Medical Centre, an installation orbiting planet A 1 in the HIP 17519 system. But she is dead now. She’s not coming back, and this is my last word on the subject. My second video blog on the Lords of Midnight. This time I explore how the book came about and some of the challenges involved in writing it. Lords of Midnight is complete! At 10:40 this morning I made the final tweaks to the final draft and sent the manuscript back to the publisher. It’s been a long and weary road since completing the first draft back in December last year, but the difference between the two documents is striking. The final draft is polished, sharp, better structured and (hopefully) devoid of typos. Editing isn’t my favourite activity – I don’t know many writers who actually ‘enjoy’ it, but it’s utterly essential to the art of crafting a good story. The editors scalpel can be painful to wield, but those cuts and incisions do make for a better book at the end of the day. I am very happy with the final draft of Lords of Midnight. Chris and I have been back and forth through the lore of the game and the sequels, through all of the manuals and gameplay, even through some of Mike Singleton’s notes. We have consolidated all the existing lore, worked through the discrepancies and tried to use our judgement to decide on what Mike’s vision would have been where it wasn’t clear from the game or existing material. We’ve created arcs which span beyond just a single book, mindful that we hope to be able to write more stories in Mike’s amazing worlds. We have tried to answer, where it makes sense, some of the open questions about Midnight itself and provide a bit of history of the world via the characters that have experienced it. We made special effort to flesh out and differentiate the characters of Midnight; the primary cast of Luxor, Morkin, Corleth and Rorthron and the eponymous ‘Lords’, along with the other characters fans will be expecting to see. Conscious that there is a next book in the series with additional characters, we have woven in backstory for them too, to allow them to segue into the events of the following stories without simply ‘appearing’ in the narrative. Yes! It was (and is) our intention to continue on with what we are currently calling ‘The Midnight Chronicles’. 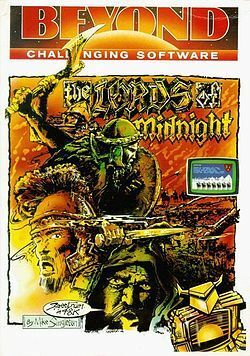 Lords of Midnight the game goes straight into Doomdark’s Revenge, the story doesn’t end here by any stretch of the imagination. We’ve worked on the lore and the structure of this book to ensure we can continue into others. 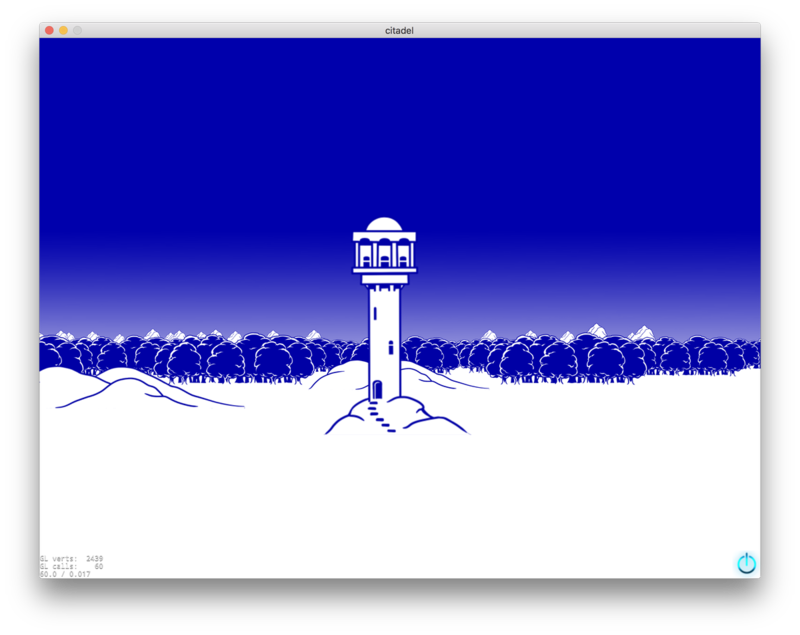 I’m very excited about writing Doomdark’s Revenge and then continuing further with the saga. I’ve enjoyed writing my first fantasy book. If it is well received and sells well then it is very likely that more books will come – the commercial success does dictate whether we’ll be able to continue. For now then, it’s back to the publisher. Cover art and typesetting is next on the list and with the book due to be available towards the end of May. Night is almost over and the eastern sky grows bright. Not long until dawn! It seems oddly appropriate that, having been working on the editing the Lords of Midnight for the last few weeks, there is still snow lying on the ground here at the official start of spring. It seems the Witchking’s power remains strong! I’m going to take that as a good omen for now. Lords of Midnight stands at a solid third draft (152,188 words) at present. I’m currently working with my editor to refine that draft into a final version which can be sent for typesetting and, ultimately, printing. 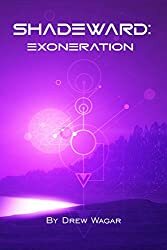 Editing is a bit of a mystical dark art, but essentially it is tightening up the narrative, making the dialogue ‘zing’ and cutting out the unnecessary fat of the story, until you’re left with a lean, pacey story, free from typos with the right speed and energy to make the book absolutely compelling. Editing is essential for a good book. Authors can procrastinate, fall in love with their world-building, over describe things, get carried away in the dialogue and forget to ground the reader in the scene, screw up points of view and slow the drama at the wrong times. A good editor doesn’t ‘read’ the book, they evaluate it critically, looking for these constructive errors and suggesting fixes. It’s the difference between having a story that ‘shows promise’ and a ‘great story’. 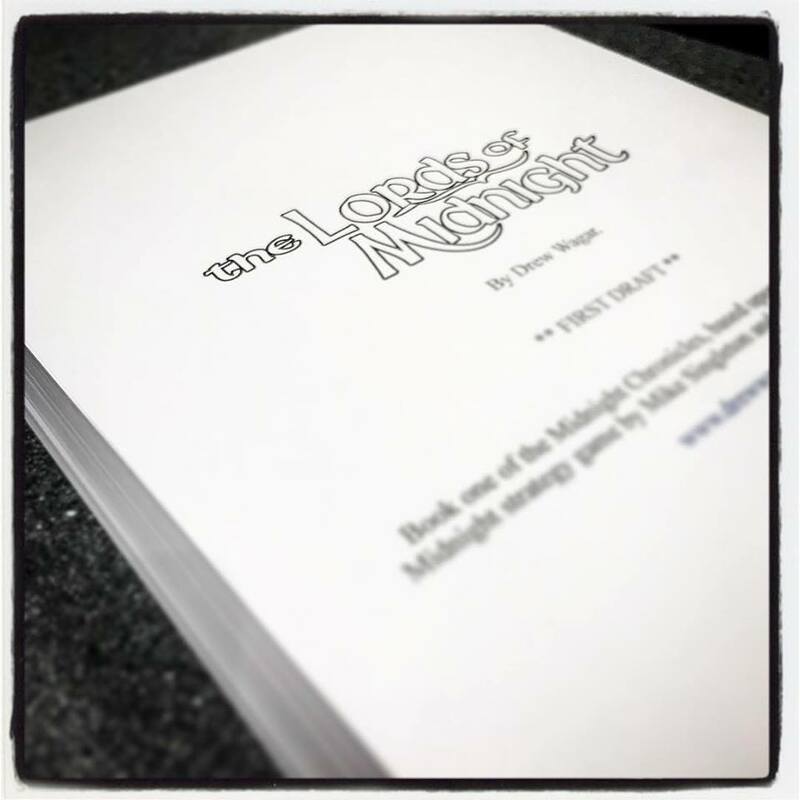 A quick update on the arrival of the Lords of Midnight novel. Been in conversations with my publisher (FBP) this week on the timing of editing, cover production, typesetting etc. Unfortunately, we have a further short delay. Editing, in particular, can’t be rushed and needs to be done properly. Apologies for this, but it’s a combination of workload and a few other events beyond our control. The birth of books is never a straightforward thing! We are now expecting the book to be available at the end of May this year (rather than March) about an additional 8 weeks. On a more positive note, my wife is reading the draft at the moment (she’s particularly good at spotting plot-holes) and so far we have a thumbs up. She likes it more than my previous book, Elite Dangerous: Premonition! Another milestone today on the road to the next book. The second draft is completed! So what do we have at this stage? Simply put, Chris and I have fixed the major continuity issues, we’ve sorted out the pace and the structure, we have an end-to-end story that works. All the lore aspects have been checked and adjusted where necessary. This is the biggest concern at this stage, particularly as Lords of Midnight is very ‘lore heavy’, there’s a lot of detail that needs to be right, both for this book and for potential future ones. Much of the stuff that is mentioned in the Lords of Midnight foreshadows the events of the other games in the series, and we want to be able to write those books too. Thus we’ve planned to ensure there is an ongoing continuity to the lore that will straddle several stories. Hopefully we will see the events of Doomdark’s Revenge, The Citadel and the Eye of the Moon. So what’s next – that would be the third draft! The second draft gets sent to professional editors, who sort out all the detailed ‘writing craft’ issues; POV, typos, repetition, overused adverbs, clichés, dodgy dialogue and so on. Basically tidying it up and making the scripts punchy and tight. It makes a massive difference to the quality of what you end up reading. All those changes come back to me for review. Typically I agree with about 95% of them. A few I will reject (usually because the editor doesn’t understand the lore in depth and they’ve picked on on something lore specific which looks odd) and a few will be just because I prefer the original. After that? It’s proofreader time. I have a bunch of folks that will read my book with a view to eradicating any remaining typos (they are tricky beasts to get rid of!). Then that final version goes back… and it’s turned a book! Yesterday I reached a major milestone in the production of my latest book, The Lords of Midnight. The first draft is complete! Those of you who have followed this blog for quite some time will know that this is an important step, it means there is a ‘story’ end-to-end based on the original plot and direction and that the greater bulk of the writing itself is done. Yet, in some ways, it’s just the start! From here the story has to be tweaked and fettled. I do edit quite a lot as I go on, so this draft isn’t as rough as many fellow authors’ would be, it’s probably more akin to what most writers would consider a ‘second draft’, but it still needs a lot of work. However, before that, the story needs to have its lore, characters, situations and overall feel checked by the LoreMaster himself; in the case of the Lords of Midnight this is the inestimable Chris Wild who is both the expert and the ultimate decision maker on the lore as it relates to Mike Singleton’s world. As of yesterday evening a draft is with Chris for review and comment. Thus there is an awful lot of work still to do, we may have won a skirmish, but the battle continues! However, having skim read what we have already, I’m confident we have a good foundation to build upon. For me, after the event, it’s fascinating to see the differences between the first draft and the final edit. There are massive changes in some places, minor nips and tucks in others. It’s all aimed at ensuring the book, and the story it tells, is of the highest possible quality. This book was original promised back in 1984 by Beyond, the company that published the original game – they failed in that particular quest. 33 years later we’re on track to close that circle – but we want to ensure that we do the best job we can, making something that Mike himself would be proud of and that lays a solid foundation for future books if this one is successful. For now then, a brief hiatus as the year draws to an end. The Solstice is here, but before long glad hearts and minds will turn to longer days and the promise of spring. A new dawn for Midnight cometh! As my publisher would say… onwards! A little bit of a milestone today – signed off the official Elite Dangerous forums for an extended leave of absence, after a 5 year stint I’m leaving that universe behind me and moving on to pastures new. I’m not involved with the game content at all any more – so please don’t ask me about the v2.4 narrative or the Thargoids – nothing to do with me! Oddly enough, I played the original Elite for about 5 years (from 1984 to 1989) when I headed off to university, so it feels like a good time to move on after a similar timescale. I’ve uninstalled the game from my PC (along with a few other games too) in order to focus all of my spare time into my own creative endeavours – no distractions – though I’ll obviously be popping along to conventions and community events where I can. In its place comes the space simulator “Space Engine” which provides similar, and often even better looking, space backdrops with the advantage that I can ‘go anywhere instantly’ and programmatically alter the contents with a bit of scripting. I’ve also acquired a commercial license for it, allowing me to export and use videos from it without having to worry about royalties. That gives me huge flexibility and creative control I didn’t have with ED. 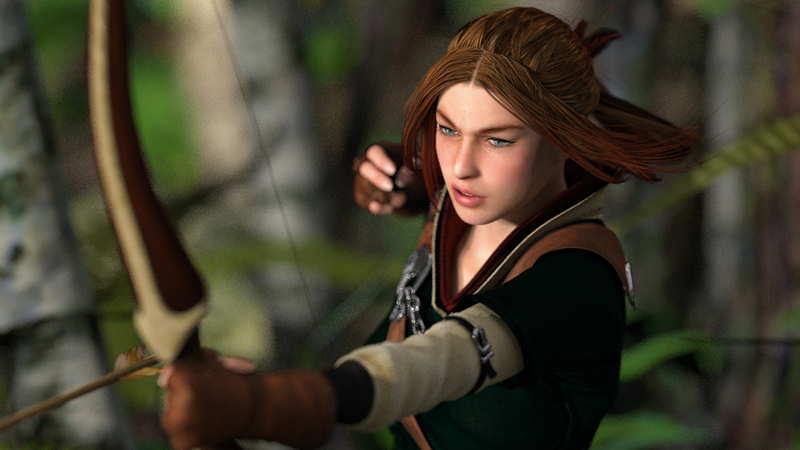 Alongside this I’m also learning some 3D character animation software – I rather liked the ED character creator, but it was very limited, now I’ve got the opportunity to create animated characters all of my own. With the combination of these two elements, a truly compelling narrative, some music and a lot of work, I’ve got all I need to make my own audio and video stories. These will, naturally, be based on my books – the bread and butter of what I do won’t change – hopefully I’ll be able to crank them out faster. What I have decided to do is expand the Shadeward universe quite dramatically. Shadeward is set in a semi-post apocalyptic setting, but the event that precedes the Shadeward series of books is only alluded to, never detailed. I plan to go back there and write books about that, but also go forward to alternative worlds that are concurrent with Shadeward, and tell other stories. Whereas the folks in the Shadeward series suffered from regression in their technology, other worlds may have advanced in the same time frame, leading to the possibility that worlds not too far away may have very advanced technology. In short this gives me the ability to write a space opera in the same setting, combining the best of what I did in my ED books in a new and more consistent universe where I don’t need to worry about ‘retcons’ or the limitation of gameplay. I can also stick to ‘real’ physics too. What I plan on providing is a space opera series set in this universe which fans of my ED books will find familiar in many ways – politics, skullduggery, machinations, space battles and so on – but in a fresh new environment and backed up by some ‘transmedia’ content in the shape of audio and video. With my ED books I could never be in full control of my destiny, as I was subject to decisions that could sometimes overrule the stories I wanted to tell. 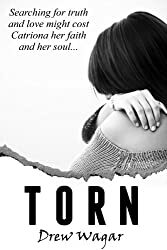 I couldn’t construct as much detail in the plots as I wanted to, as I was never sure whether I’d be able to continue the story in the time-frame I needed, which required me to wrap things up – sometimes prematurely. There will be no such limitations for the upcoming books – I’ll release them when I’m ready and I’ll be free to convert them into whatever media I want to, when I want to – that gives you, the reader; listener and watcher – a better end result too. The Diaspora Saga, of which Shadeward will be a part. 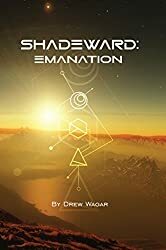 The expanded Shadeward universe (working title ‘Diaspora’) will be my ‘magnum opus’ 😉 In total I plan for it to be 16 books (4 of which are the classic Shadeward series) – 4 will be a high tech ‘space opera’, 4 will have an ‘exploration’ focus and 4 will tell the story of ‘what happened before’. That’s a lot of stuff (another 14 years worth) ! By the time I’m finished I’ll be somewhere near 60 and ready to retire. So, moving on from ED is going to result in more stories… and I’m confident they will even better than what has gone before. Right now I’m close to completing Lords of Midnight – Shadeward 3 is up next… and the project will continue. Thanks to all of you who have supported me in my writing all the way from my Oolite fan fiction and through the Elite Dangerous novels – I hope you’ll stick with me for more adventures in the void. 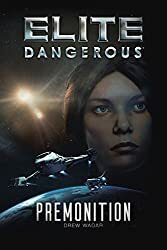 Rather pleased to announce that my latest book, the official novel Elite Dangerous: Premonition, won ‘Book of the Month‘ over at KindOfBook.Com. Premonition was selected as a nominee amongst 12 other books that have recently been published and was the only SF novel in the mix. One of the other novels was (and is!) an Amazon bestseller, sitting in the top 100 ebooks sold. Another was by a New York Times bestselling author. Frankly, once I saw that I didn’t think Premonition had a chance, but I was honoured to be included. After a few days Premonition had pushed itself into a credible third place, unsurprisingly behind both of the novels mentioned above. However, with a few posts on social media, the FDev forums, reddit and a mention in the FDev newsletter (Thanks to Ed and Zac!) the word got out and Premonition’s share of the vote began to climb. 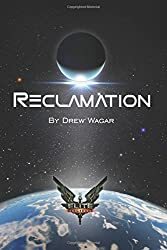 Soon we were in second place, and a few days before the end of the competition, the combined might of the Elite Dangerous community and the fanbase for my stories pushed Premonition into a commanding lead, 15% ahead of the bestselling Amazon entry. To be frank I was a little gobsmacked by the result, but I shouldn’t have been. Time and again the Elite Dangerous community has proved its worth, it’s ability to mobilise and come together to support things. This was also brought back this week in a different way. The charity I support with 10% of the proceeds of my books suffered from theft compounded by an arson attack. They pretty much lost everything as a result, utterly devastating. They’ve been working for years to support young people who’ve fallen out of school and college and need help getting their lives back together. My family and I set up a JustGiving page to raise a few funds to help them get back on their feet. We set a modest target, and cracked it in a few days, but then the word got out to the Elite Dangerous community once more. In fact, the community got behind the funding before I had a chance to ask them. Lave Radio, Obsidian Ant, NatScrambles, Malic and DJTruthSayer were already on the case. As a result funding has skyrocketed to over £2,000. An amazing, humbling and astonishing result. Once more, I can only say a big thankyou. The Elite Dangerous community has supported me far more than I could ever have hoped for. You’re all brilliant.